Have you noticed your vision becoming increasingly blurry? Are your contact lenses fitting poorly, preventing you from seeing properly? Both of these symptoms can be signs of keratoconus, a progressive corneal disease that affects approximately two out of every 1,000 individuals. Keratoconus occurs when the normally round cornea thins and begins to bulge outward like a cone. This irregular conical shape deflects light as it enters the eye on its way to the retina, distorting vision. Both eyes are typically affected, but it’s not uncommon for one to be affected worse than the other. 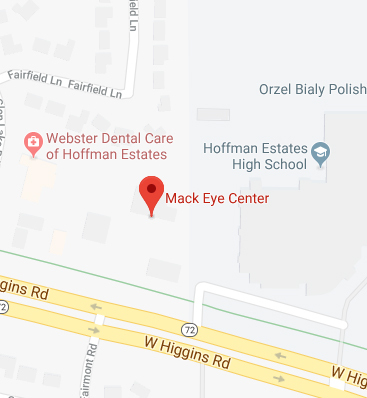 For over 18 years, the trusted eye surgeons at Mack Eye Center have dedicated themselves to providing quality and personalized eye care. If your vision is blurry and you suspect it may be caused by keratoconus, our eye specialists would be happy to assist you. Read on to learn more about keratoconus, including its symptoms and the treatment options we offer. Or to schedule a keratoconus consultation, please call (847) 755-9393 today. Keratoconus occurs when the cornea is not strong enough to hold its round, dome-like shape. This weakening of the cornea can be caused by many factors, including a lack of collagen support in the eye. Collagen is a naturally occurring protein that supports tissue structure throughout the body, including the eye. 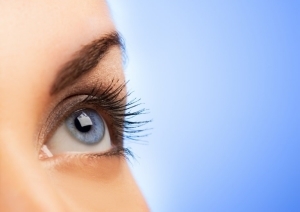 A lack of collagen in the eye can cause the cornea to bulge. A slit-lamp is a binocular microscope used to examine the structures of your eyes, including your corneas, under high magnification. During the slit-lamp exam, you will be asked to place your forehead and chin against the rests on the front of the instrument. Your eye doctor will look for common symptoms of keratoconus such as corneal thinning and a cone-shaped appearance. Corneal topography is a computer-assisted instrument that creates a three-dimensional map of the surface curvature of the cornea. This non-invasive tool produces a map of the cornea that allows our doctors to assess the condition of the cornea’s surface. A medical device called a pachymeter is then used to measure the thickness of the eye’s cornea, revealing early signs and progression of the disease. The good news is that with proper detection and treatment, keratoconus can be slowed or stopped. The eye surgeons at Mack Eye Center are experienced in diagnosing and treating keratoconus. Our doctors use the latest testing and diagnostic tools to assess the severity of the condition. After diagnosing keratoconus, Mack Eye Center will work with you to develop a comprehensive treatment tailored to your unique requirements. Early-stage keratoconus can be treated with prescription glasses or contact lenses. However, as the condition progresses, the bulging of the cornea makes it impossible to wear contact lenses. Advanced stages of keratoconus may be treated with corneal cross-linking, an innovative, in-office procedure that helps strengthen the cornea, slowing or stopping the progression of the eye disease. Learn more about our diagnostic tests and treatment options for keratoconus here. Intacs are corneal implants that are surgically placed when patients can no longer properly see with contact lenses or eyeglasses. Through a minimally invasive procedure, the semi-circular implants are placed just under the eye’s surface in the periphery of the cornea, reshaping the cornea for clearer vision. Collagen crosslinking (CXL) is an innovative, in-office procedure that applies a combination of vitamin B2 drops and ultraviolet light to the eye, strengthening collagen fiber bonding. The riboflavin stimulates new connections between collagen strands within the cornea, strengthening the whole structure. Depending on the severity of the condition, contact lenses may still be needed even after collagen crosslinking is done. But because collagen crosslinking flattens the cornea, contact lens wear is much more comfortable. In some cases, Intacs may be implanted after crosslinking to further enhance vision. If you are suffering from blurred vision or are experiencing other keratoconus symptoms, reach out to the trusted eye surgeons at Mack Eye Center. To schedule a one-on-one consultation, please call (847) 755-9393 today.